A strong storm system is moving out of the Rockies and strengthening as it arrives in the Plains on Wednesday. The system will bring severe storms with very large hail, damaging winds and a few tornadoes late Wednesday from Texas all the way north to Wisconsin. 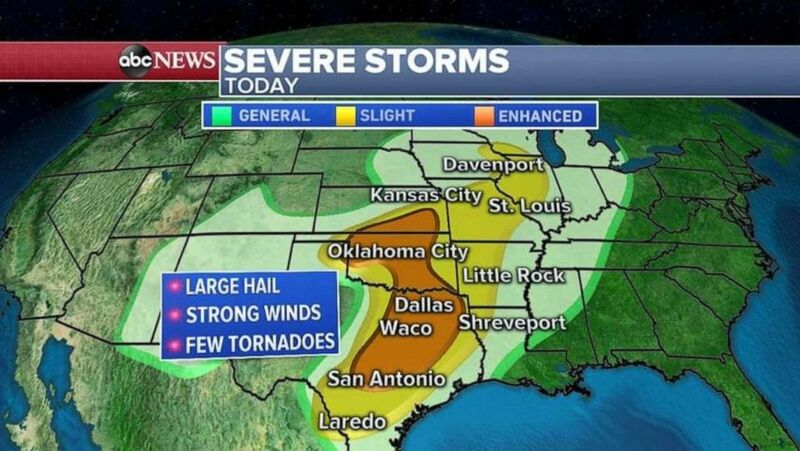 The worst threat for damaging storms is from San Antonio to Dallas and north into Oklahoma City and Wichita, Kansas. Hail up to the size of a baseball is possible. The threat for severe storms stretches from San Antonio all the way north to Oklahoma City and southern Kansas. 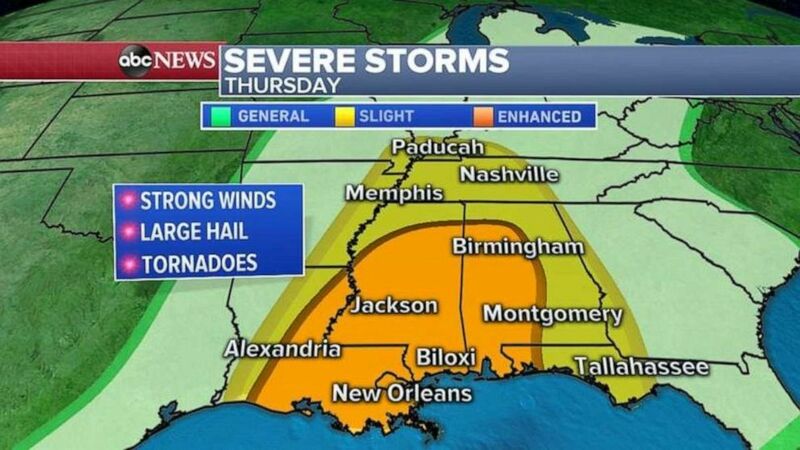 By Thursday afternoon, the storm system will move east, bringing severe weather and an increasing tornado chance from New Orleans to Jackson, Mississippi and into Birmingham, Alabama. Damaging winds and hail are also possible from Tallahassee, Florida, all the way north to Memphis and Nashville, Tennessee. Strong winds, large hail and tornadoes are possible in the Deep South on Thursday. The storm system slows down on Friday as it approaches the East Coast with more severe weather. Severe storms will fire up from Tampa, Florida, all the way up to Washington, D.C. The biggest threat will be in the Carolinas and southern Virginia, where damaging winds and a small threat of tornadoes are possible. 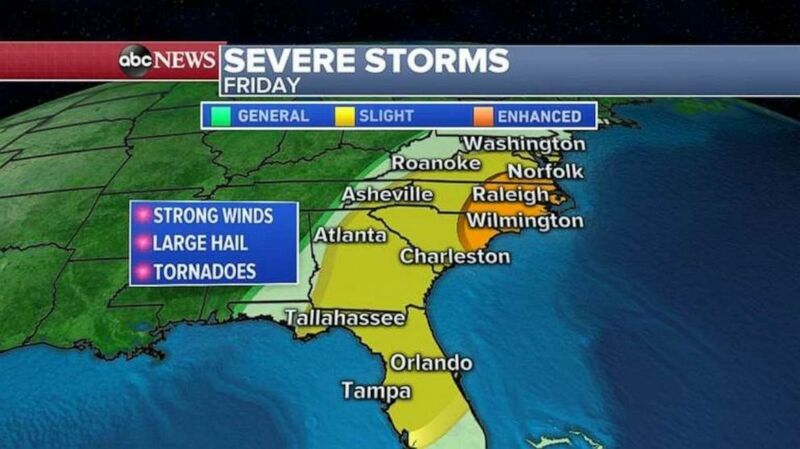 The threat for severe weather moves into the Carolinas, Georgia and Florida on Friday. As the storm moves east, a lot of rain will fall from Texas to New England. Some areas could see 2 to 4 inches of rain, and even more locally. 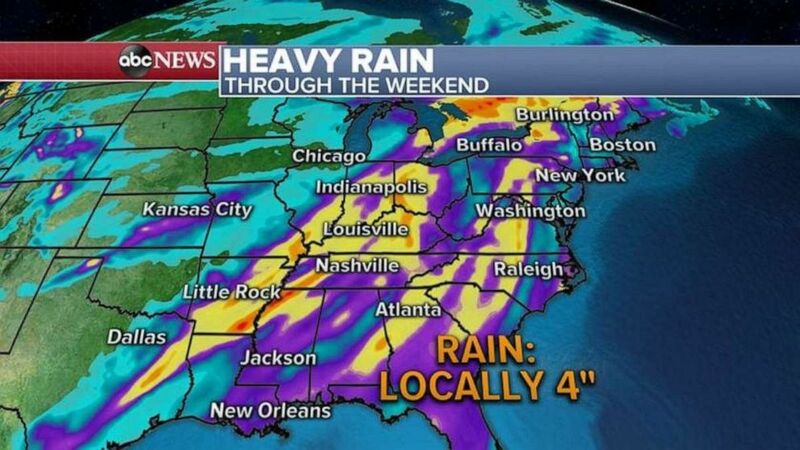 Parts of the South could see over 4 inches of rain locally.